Charles E. Carey, 55, one-time chief consulting engineer of the Bonneville power administration and a pioneer in Columbia river development, died Sunday at the Veterans’ hospital in Sawtelle, Cal., after an illness of several months. 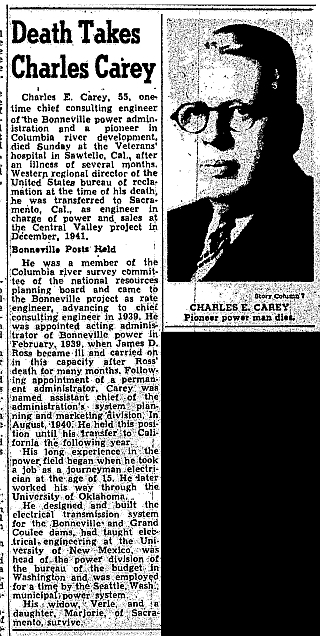 Western regional director of the United States bureau of reclamation at the time of his death, he was transferred to Sacramento, Cal., as engineer in charge of power and sales at the Central Valley project in December 1941. He was a member of the Columbia river survey committee of the national resources planning board and came to the Bonneville project as rate engineer, advancing to chief consulting engineer in 1939. He was appointed acting administrator of Bonneville power in February, 1939, when James D. Ross became ill and carried on in this capacity after Ross’ death for many months. Following appointment of a permanent administrator, Carey was named assistant chief of the administration’s system planning and marketing division. In August, 1940. He held this position until his transfer to California the following year. His long experience in the power field began when he took a job as a journeyman electrician at the age of 15. He later worked his way through the University of Oklahoma. He designed and built the electrical transmission system for the Bonneville and Grand Coulee dams, and had taught electrical engineering at the University of New Mexico, was head of the power division of the bureau of the budget in Washington and was employed for a time by the Seattle, Wash., municipal power system. His widow, Verle, and a daughter, Marjorie, of Sacramento, survive. The Oregonian, Portland, Oregon, 1 September 1945, page 13. Posted on 9 September 2012 8 September 2012 by N. P. Maling	This entry was posted in Family History, Newspapers and tagged newspaper obituaries, Oregon, Portland Oregon. Bookmark the permalink.